Year after year I feel that it gets hotter and hotter–I know climate change has a lot to do with this which is why I wrote my thoughts about it HERE–and as much as I want my kids to enjoy summer, the heat it brings can sometimes be unbearable na e.
Our home has a sunrise view and our living room in particular basks in the sun’s glorious rays. So every morning, mid morning and early afternoon, you can really feel the heat–like being inside an oven. 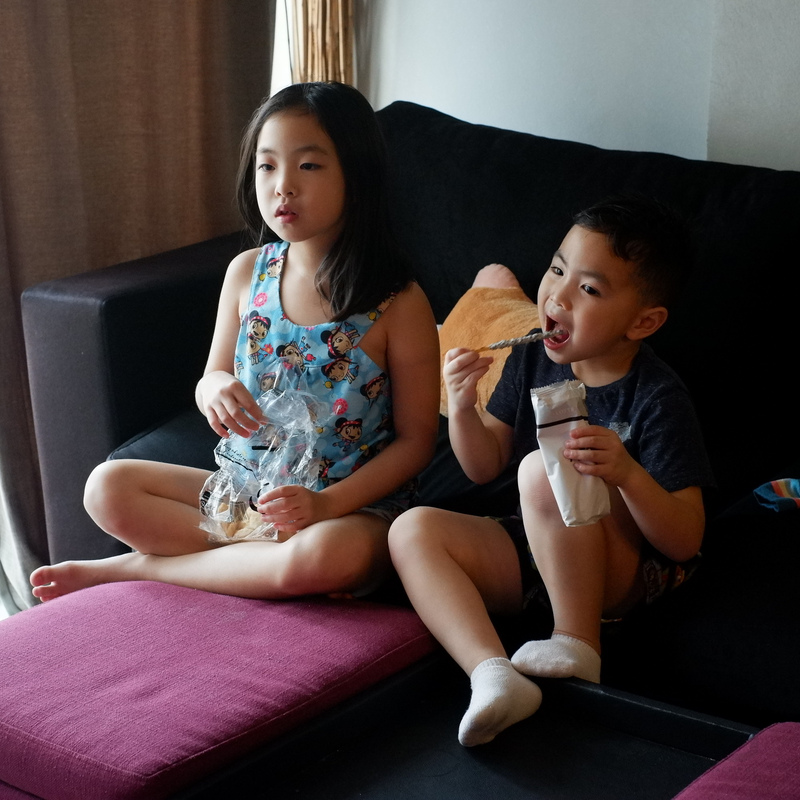 This always prompts my kids to hang out in their room instead with their window-type aircon turned on almost round the clock (you can imagine how our electricity bill always shoots up over summer). I know most parents can relate to this–summer being an expensive time of the year in so many ways! Heehee. Since our living room is mostly where we hang out, we decided to finally get an inverter air conditioner for it. Still a work in progress. Mr. JG decided to add wooden planks to give the accent wall of our living room a fresh new look. We got an Electrolux Vita Inverter Split Type Air Conditioner. The 2.0 horsepower is enough to cool not only our living area but also our dinning area. Another reason for me to just enjoy staying at home! The Electrolux Vita Inverter delivers energy savings with its advanced technological features. Inverter technology allows air conditioners to be more powerful whilst being more energy efficient at the same time. This gives remarkable advantages: low noise, energy savings and optimal temperature without sudden changes. 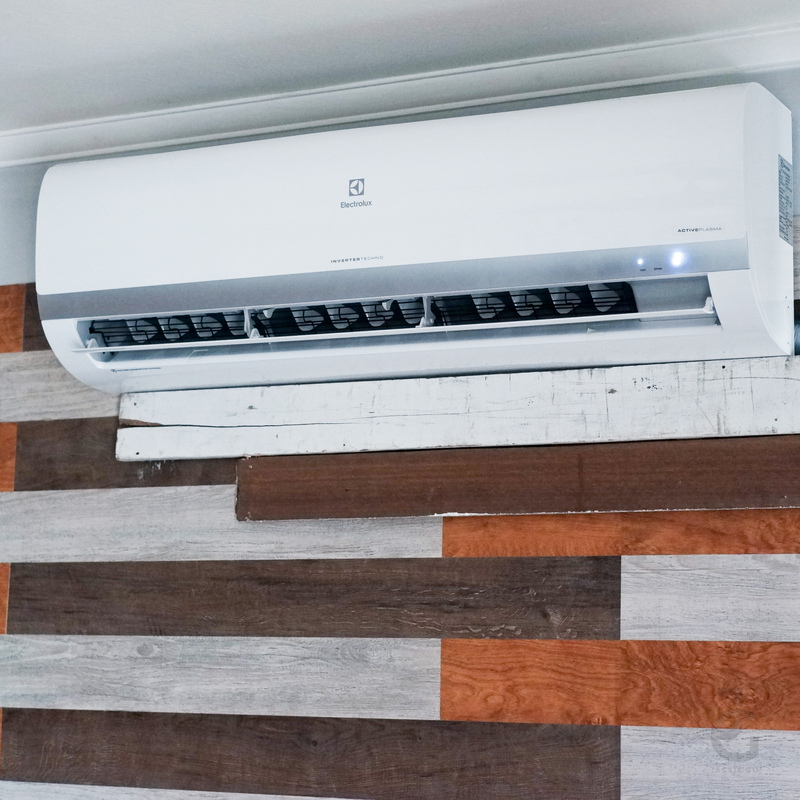 I won’t go technical but instead I’ll share some reasons why we love our Electrolux Vita Inverter Split Type Air-Conditioner. Gone are the days when you have to wait for 10, 20 or 30 minutes for the air conditioner to reach the preset temperature. The Vita aircon has a turbo function that makes it possible so no matter how hot it is, in just a few minutes the room gets cooler. 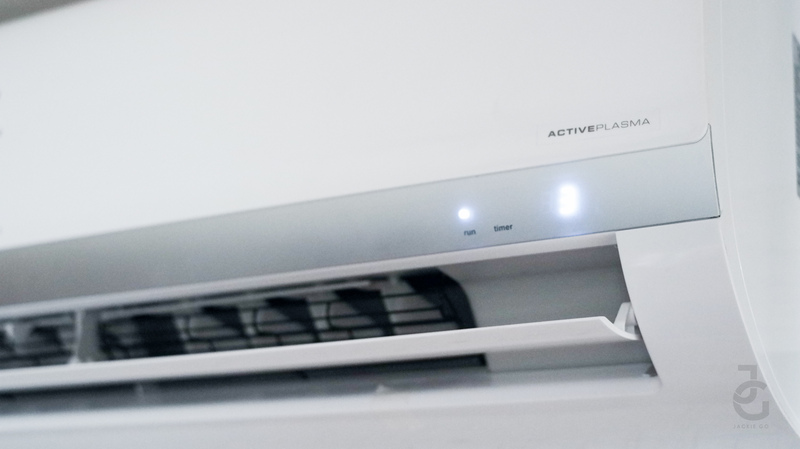 The Vita air conditioner comes HD Filter to eliminate dust particles and bacteria-causing elements, and an Active Plasma System, where a cold plasma generator releases both positive & negative plasma from the air outlet to every corner of the room. Through chemical action, it widely ‘kills’ various airborne bacteria and virus in the room. 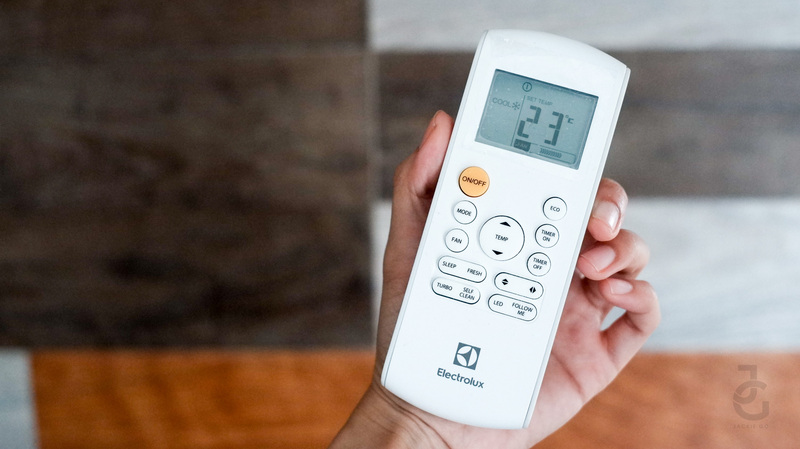 I FEEL, is one of the unique features of Electrolux air conditioners, where a temperature sensor is built into the remote controller. When activated, the ‘I FEEL’ function will maintain the set temperature where the remote controller is located and not where the unit is installed on the wall. In this way, there is a more reliable and comfortable temperature control where the user may be located. 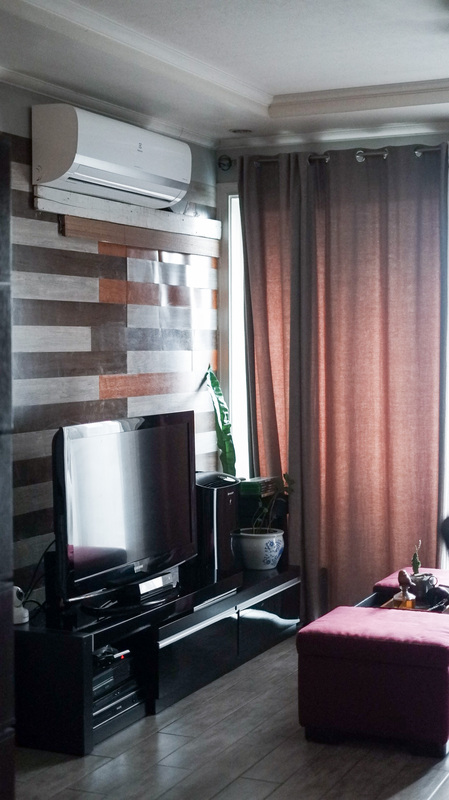 Our Vita Air-conditioner is faced directly to our sofa and there are times the curtain on that side of the living area is drawn back so direct sunlight hits that spot. To make the temperature more suitable, I like activating the I FEEL function (by pressing the FOLLOW ME button) and placing the remote on the sofa arm rest so the Vita Air-conditioner can adjust the temperature accordingly. It sends a signal to the airconditioner with 3 minutes interval until I press the FOLLOW ME button again. Such a cool feature! The SLEEP button enables the unit to maintain the most comfortable temperature for a good night sleep and save energy. In COOL mode, the air conditioner will automatically increase 1ºC (2ºF) after 1 hour and will increase an additional 1ºC (2ºF) after another hour. It will continue the last temperature for 5 hours. Vita Aircon has three modes you can choose: cool, heat and fan modes. It also has an auto mode that lets the air conditioner logically choose the moe of Cooling, Fan, and Heating by sensing the difference between the actual ambient room temperature and the setting temperature on the remote controller. In auto mode though, you can switch the fan speed since it’s automatically controlled. Aside from the modes I mentioned, the Vita air conditioner also has a dehumidifying option. This was one of the features that I’ve come to love because over summer, the heat and humid was just too much, I’m just glad I could control both. The temperature can be set & adjusted from 17ºC to 30ºC with 1ºC increments. When your air conditioner is used outside of these ranges, certain safety features will activate and cause the unit to perform less than optimal. I honestly don’t think anyone of us living in the tropical country will ever use the heat & dry more but just in case, I’m sharing it. It has a self-clean option that when activated the air conditioner will continue to operate eat very low power to dry up condensed water and prevent mildew growth. It’s self-diagnose function on the other hand displays an error code on the unit’s LCD screen, making it convenient for service to identify and fix issues. Two reasons why it’s easy to use and convenient–no need for guessing. Yep. You wouldn’t know it’s turned on just by judging the sound it makes because it gives off minimal noise. There’s such a huge difference compared to our old window-type air conditioner. You’ll barely hear any sound especially when the television is turned on. Perfect for families who have babies! Keep doors and windows closed. Limit energy usage by using TIMER ON function. Do not block air inlets or outlets. Regularly inspect and clean air filters. Electrolux Vita Inverter Split Type Aircon is available at major appliance stores nationwide. Price starts at Php 33, 995.